We are excited to showcase this spring issue’s special section encompassing Woman You Should Know. This series highlights a few of the many accomplished ladies involved in local industry. Whether they are entrepreneurs, directors, or support staff, they are an integral part of our local economy’s success. We hope you enjoy looking at these professionals’ lives in and out of work, as much as we relished putting this segment together for you, our readers. Do you WANT A SUBSCRIPTION? Send an email to subscriptions@ hometown-living.com and put ALM in the subject line to be added to our digital subscription list which will alert you to view magazines online at www. hometown-living.com. We want to thank our advertisers. Let them know you saw their ad in this issue! Please check out their profiles and read a little about their background and what inspires them at work here in the Big Country. There are many accomplished professionals in our area, but you can’t have all work and no play. Cycling is a favorite to many residents, but we were thrilled to catch up with one group in particular, The Steamboat Cycling Club. Named after Steamboat Mountain south of town, our photographer, Tiffany Smith, got to see them in action on an early Saturday morning. Read about members Mark Spurlock, Bill Minter and more and the adventures they have while staying fit. 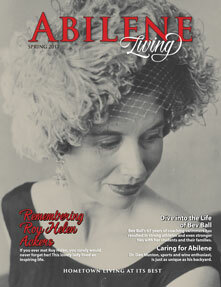 Thank you for reading Abilene Living – your first hometown magazine showcasing Abilene living at its best. We love to hear from you – let us know about your events and any profiles you would like to see in future issues. As always we welcome your family pictures – give us a call to learn more about participating in future editions. 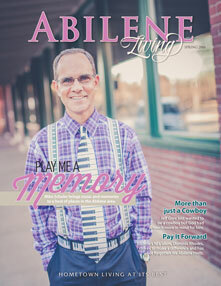 This issue is chock-full of great people in our community using their gifts for good in a variety of ways. We are each given different talents, but what good are they if we keep them to ourselves? Let your light shine by using those talents as you are called to do! For Jackson Cadle (9), it is has been putting his entrepreneurial dreams into motion - no matter his age. Throughout Bob Hunter’s life, using his talents has taken many forms. What are your gifts? How can you put them to use today? A small act can make a big difference in someone’s life. Joey Light was the high school principal and basketball coach while my sister, Ann, and brother, John, were in high school at Hawley ISD. Now, over 20 years later, his positive impact has made a difference as my sister is entering her 22nd year as an educator (now teaching at Stamford). She suggested this article and continues to praise “Coach Light” for who he is as a person. I am so excited about this fall’s special section showcasing area thrift stores. I LOVE flea markets, antiquing, digging through barns, and repurposing my “treasures”. In each town I always want to know where the thrift stores are, so we have made a list of non-profit thrift shops and hope we haven’t left any out. Take a look at Get Thrifty and go donate and dig today! PS: Below is a picture of my favorite person – my grandmother, Dorothy Lundgren. She is the most humble, fun and hardworking person I know (she shies away from all attention including cameras, so I was thrilled to get this shot of her at 92 years young). She and her lifelong friend, Fern Ballard, were two of the original members when the Stamford Auxiliary was formed in 1977. For 40 years she has volunteered her time one day a week. Every Monday for as long as I can remember she and Fern have worked at the Pink Lady Thrift Store. This inspires me. May we each strive to live lives of service to others; sharing our gifts – be it a talent, an ear, or our time with others. On the cover of this issue we pay our respects to the late Roy Helen Ackers. This beautiful picture is one she shared with me over seven years ago as I toured her home and closets in preparation for our debut edition of Abilene Living Magazine. For our first issue, she wrote a mini autobiography about her life growing up near Anson and the wonderful years she spent working, volunteering, and living in Abilene. Her kindness, sense of humor, humble spirit, and flair for fashion will be missed by all. There is much to be thankful for in 2017 – and our readers, advertisers, and creative staff are on the top of the list! In 2016 we received some of the kindest letters, emails, and calls commenting on the articles and content. We love to hear from you! Tell us what you love and what you would like to see more of in future issues. As always we want to feature your events and uplifting stories about the great things and people around town. Check out our Hometown Contributors page – showcasing profiles of locals who help make Abilene Living possible. Meet our new Content Coordinator, Tabitha Baase. Shoot her an email with your suggestions: Tabitha@ hometown-living.com To get your complimentary copy go by any advertiser location listed in the back of the magazine in the Index of Advertisers. 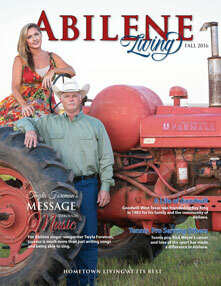 Let them know you saw their ad here in Abilene Living Magazine – the first magazine of its’ kind in the Big Country! As always we thank you for reading ALM showcasing Hometown Living At Its Best. So school is back in session which means summer is over, whether it feels like it or not! We wanted to take a minute to say THANK YOU to our sweet parents (AKA grandparents to these three sweeties) who babysit throughout the year, but went overtime for us throughout the summer months. We love you, Charles & Linda Perkins (of Abilene) and David and Diane Lundgren (of Hawley). Jorie (3), Gatlyn (5), & Georgia Lee (1) always have the best time with their grandparents! People say you love your children, but that there is a special love you have for a grandchild. As a new generation takes shape it’s always surprising to look back at how time flies. What are you spending your time doing? Is it full of distractions that don’t matter and activities that won’t last? We discovered many Abilenians putting their God given talents to good use; Twyla Foreman, Kim Hudson, and the Martins to name a few. Also check out a group of ladies who have spent a lifetime in friendship – through the ups and downs life has brought in “Sisters in Spirit.” It’s inspired me to want to be a better friend and cherish the sweet relationships I’ve had for years. Hope it does the same for you! 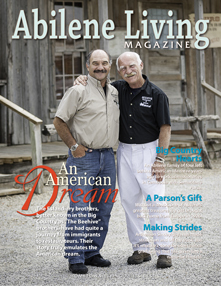 We love Abilene and are grateful to our readers for supporting Abilene Living – the FIRST to bring a coffee table quality magazine to the Big Country. Thanks to our advertisers this publication is still free to you. Pick up your copy at any advertiser location and please tell them you saw their ad in this publication. Check out the Index of Advertisers (in the back) and remember to Shop Local! We love profiling our talented and diverse neighbors with you! There is so much the Lord is doing in our neighborhood and we are grateful to be able to share their testimonies. A few of the many stories in this edition include the 52nd Smorgasbord, celebrating culture and Christ, also check out ‘He Gives Me Strength’ to hear one families’ strength in crisis. Ever wonder who is behind the scenes at ABILENE LIVING….see our ‘Hometown Contributors’ section for a peek at the many who make it all possible. We thank them for their creative efforts. Do you WANT A SUBSCRIPTION? 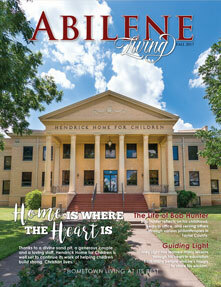 Send an email to subscriptions@ hometown-living.com and put ABILENE in the subject line to be added to our digital subscription list which will alert you to view magazines online at www. hometown-living.com. We want to thank our advertisers. Let them know you saw their ad in this issue! There is no better way to show HOMETOWN LIVING AT ITS BEST than to spend your hard earned money here in your hometown. Check out the Index of Advertisers list (located at the back of the magazine) and start shopping! LIKE us on Facebook! In this issue, we have more feature articles than ever before. 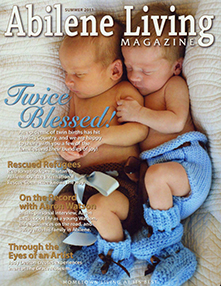 Texas country artist and Abilene local, Aaron Watson and his wife, Kim, share about the loss of their fourth child and how their faith in God has seen them through this heartache. Pictured on the cover are their three older children putting you in the mood for spring. Also featured are some local philanthropies making a difference. There is always an opportunity to give back and our neighbors are making a difference! 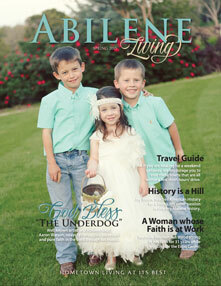 Do you WANT A SUBSCRIPTION to Abilene Living Magazine? Email our talented Office Manager, Kati, and let her know you want on the ABILENE digital subscription list which will alert you to view our magazines online at www.hometown-living.com. 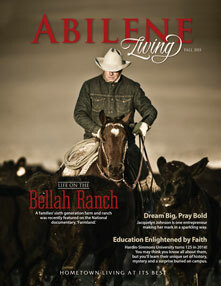 ‘LIKE’ us on Facebook at: With You In Mind Publications for additional updates on all our Texas and Oklahoma markets. We want to thank our advertisers as always for their participation which keeps ALM coming to you FREE of charge! There is no better way to show HOMETOWN LIVING AT ITS BEST, than to spend your hard earned money here in your hometown. Check out the Index of Advertisers list (located at the back of the magazine)! It's finally FALL, y’all! Abilene is busy thinking football, back to school, & holidays. We all agree summer is a blast, but there is nothing like getting back into a routine and starting to ponder cooler weather and holiday fun just around the corner. Check out the LOCAL SHOPS advertising within these pages and get a head start on your Christmas list! There is no better way to show HOMETOWN LIVING AT ITS BEST, than to spend your hard earned money here in your hometown . Personally I do all of my shopping and gift buying here at home; it not only beats the rush and drive to the ‘city,’ but all of the one of a kind things I am looking for can be found in the here in the Big Country. Check it out (see the last page for an Index of Advertisers)! 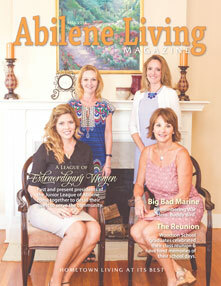 The attractive ladies on this issue’s cover are just a few of the many women involved in the Junior League of Abilene. This organization is committed to making a difference. In a community as charitable as Abilene, it is never difficult to find people willing to work hard! Read To Haiti with Love featuring professionals following a calling to lend a hand on a medical mission. Linda Egle, is also on mission….an Eternal Mission! Read these articles & more…Please also try some of the delicious recipes submitted to this second printing of Hometown Cookin’ . This is YOUR HOMETOWN publication; make it your own by sharing with us: recipes, article ideas, weddings announcements, newborn pictures, and events. 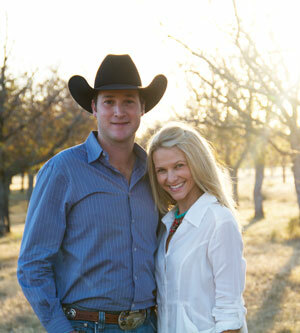 HOMETOWN WEDDED BLISS is back by popular demand. Please feel free to send in your wedding announcements in for the SPRING edition (call for pricing and deadline – there is a discount for early submission so don’t be late!). 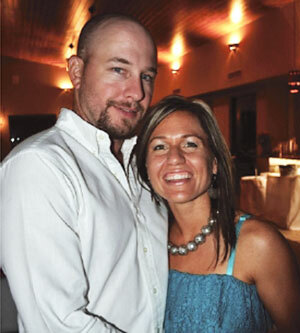 Send your wedding announcement questions and submissions to heather@hometownliving. com. 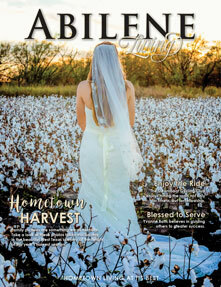 Abilene Living always strives to put jobs back into the local community by utilizing local photographers and writers (both beginners and seasoned). We are actively looking for both so please email us if you would like more information on getting involved in ALM and seeing your work in print! We want to thank our advertisers; mention that you saw their ad in this publication! Their participation allows ALM to come FREE of charge to you! Check them out in the Index of Advertisers (last page of the magazine) and go by to get your copy today. Also, view our magazines online at www.hometown-living.com & ‘LIKE’ us on Facebook at: With You In Mind Publications for additional updates on all our Texas and Oklahoma markets. With the coldest winter in over 100 years I know we are all looking forward to spring and some patio weather. We are so thankful for our loyal readership here in Abilene and the Big Country. 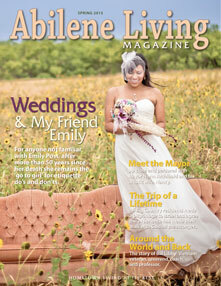 This issue we are introducing TWO new sections, Hometown Cookin’ and Hometown Wedded Bliss! Have your photographer contact us for an opportunity to have your wedding featured in future issues. We also welcome local cooks to contribute their one of a kind recipes with us to be considered in Hometown Cookin’. This edition is one of our most diverse yet. 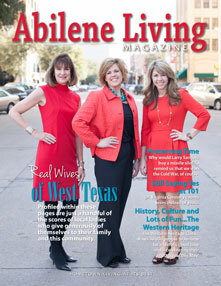 The upcoming Western Heritage is celebrating their 30th anniversary and Abilene Living has the exclusive! Take a tour down memory lane with founders, Jimmy Parker and Phil and Jane Guitar. ALM has more in depth profiles of hometown residents than ever before. We were so honored to have Dr. Virginia Connally sit down with us to share memories and insights from her 101 years. As always we want to thank our advertisers for their involvement – help us to thank them by Shopping Local. Their involvement allows this publication to come FREE of charge to you! Check them out in the Index of Advertisers (end of the magazine) and go by to get your copy today. Also, view our magazines online at www.hometownliving. com & ‘LIKE’ us on Facebook at: With You In Mind Publications for additional updates on Abilene Living and our other Texas & latest Oklahoma market. Hello Abilene and hello fall! I love this time of year….bringing crispness to the air, football to the field, and family & friends to the table for holiday fun! Speaking of food, this edition of ALM features the well known Esfandiary brothers, Ali and Nariman, owners of The Beehive. This is one of my favorite local eateries, and being a Jones County girl, I have been enjoying their food since I was still in diapers. The Esfandiary’s unique story brought them across the world to Albany and now Abilene; they truly are an example of the American Dream. Abileneans are impacting the world in which we live in many positive ways. Reaching out to help others while spreading God’s love and message across the globe is a powerful thing. In Big Country Hearts in Cambodia and From Asia to Abilene & Beyond you can read about your neighbors and how they are answering God’s call in their lives. We want to thank our advertisers! Please help us to thank them by SHOPPING LOCAL and mention that your saw their ad in the one and only Abilene Living Magazine! Their participation allows this publication to come FREE of charge to you! Check them out in the Index of Advertisers (last page of the magazine) and go by to get your copy today. Also, view our magazines online at www.hometown-living. com & ‘LIKE’ us on Facebook for additional updates on ALM and our other Texas markets at - With You In Mind Publications. Spring has Sprung and we are excited about all of the Happenings in our Hometown. Please continue to share them with us at cara@ hometown-living.com. Also in every issue, Hometown Bundles of JOY. See the darling new faces and feel free to have your photographer contact us with your newborn’s picture today! On a personal note, we want to say thank you to Paul White & Jason McDonald, our two longtime photographers – who along with many others take the fabulous pictures seen inside each issue. Our key writers, Rebecca Parvaresh and Esther Millette, always add a personal touch to their professional work – as well as keep a pulse on the busyness that is Abilene! In the Spring 2012 issue we featured Doris Shead, owner of The Lydian Market (on S. 20th), named for Lydia in the Bible who prospered because she used her business as a ministry. We continue to get calls from that article wanting to learn how to get in touch with Doris. I felt it was important to share that Doris unexpectedly went to be with the Lord on February 12th. Doris diligently dedicated her store and life to Christ’s work – she was an asset to the Abilene community and will be missed. 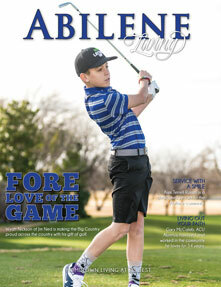 As always we want to thank our advertisers for their involvement – help us to thank them by SHOPPING LOC AL and mention that you saw their ad in Abilene Living! Their involvement allows this publication to come free of charge to you! Check them out in the Index of Advertisers (last page of the magazine) and go by to get your copy today. Also, VIEW our magazines ONLINE at www.hometown-living.com & ‘LIKE’ us on Facebook for additional updates at - With You In Mind Publications.